I was pleasantly surprised by my 99 cent purchase. I’m always a bit skeptical of the “cheap” collections and usually expect and entertaining time, but I had a hard time putting the collection down to adult. Like, seriously guys, couldn’t put it down. I stayed up waaaayyyyy too late reading. 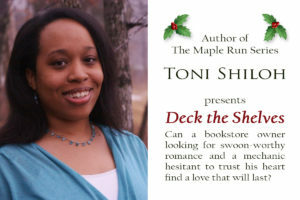 Deck The Shelves – Toni Shiloh – Once I started to read I remembered that a while back Toni had polled her readers about bookstore names and what their ideal bookstore would look like. Toni put all of the ideas together into a perfect bookstore with great characters, including an adorable little bit. I fell right in love with this prospective family. 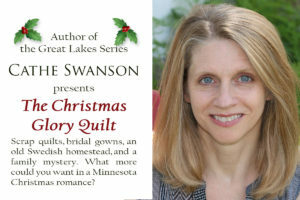 The Christmas Glory Quilt – Cathe Swanson – This is the first I’ve read from Cathe, but it sure won’t be the last. A sweet romance with just a little bit of mystery and an Aunt who likes to mix things up a bit. This story has some good secondary characters as well the main characters and I felt like I could relate to most everyone. 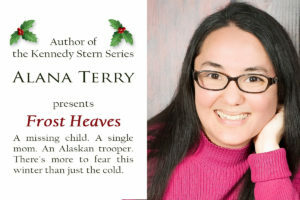 Alana Terry – Frost Heaves – I appreciated Alana broaching a tough topic that I’ve only seen in a few Christian fiction books; that of spiritual abuse and cult churches. I think Alana handles it well, balancing the lies of the cult, countered with Biblical truth and showing the inner thoughts of woman who has been set free, but also struggles with everything she was taught growing up. While I enjoyed the story, it was a bit jarring to me after the rest of the collection. I think if you know it’s more of a suspense story going into it, then you can focus on the story line; it just surprised me after a couple sweet stories and a cozy mystery. I like both Ben and Jade as characters and wish I could’ve seen more of their story as the end jumped into their relationship a little farther then what I felt was developed in the body of the story. I’d like to see a full length novel of this story that goes into more depth on their relationship. To celebrate their tour, the Christmas Light Collection is giving away a grand prize of a 6-month Kindle Unlimited subscription!! Sarah Loudin Thomas join me to talk about a special gift that they have received. In The Christmas Heirloom, four women are gifted a Luckenbooth Broach and find love at Christmas. Join me in sharing the authors’ stories. Heirlooms can be anything that is handed down from one generation to another, but what makes them special is not the item itself, but the memories and emotions that item evokes. I have an antique washstand in my bedroom that once belonged to my grandmother on my father’s side and a small landscape painting that my grandma on my mother’s side painted. Outsiders would not see anything of particular value in these items, but they mean a great deal to me because they connect me to people I loved from generations past. One of my favorite heirlooms​, however, is a recipe for zucchini bread written in my dad’s handwriting. I lost my dad when I was only 16, so this is a prized possession. Not only is the recipe delicious, but seeing my dad’s handwriting brings back a flood of happy memories every time I take it out. As for gifts I’ve received, the ones that mean the most are the ones that have heirloom potential. They tie into specific memories and emotions. A couple years ago, my husband gave me two such treasures. The first was a blanket made with a photo of my kids. My first child was leaving for college and the empty nest had begun. This was a way for me to snuggle with my kids even when they were gone. Love it! The other gift was a set of throw pillows made from pictures we had taken on a trip to The Netherlands. My Dutch publisher had brought me out for a book tour, and they allowed Wes to tag along. It was one of the best trips we have ever taken. We met so many wonderful people and saw so many amazing things. These pillows sit on my couch all throughout the year, and every time I see them, I remember that trip and smile. I’m a cross-stitcher, so this time of year, the house fills with handmade items like stockings, ornaments, and wall hangings. I’d like to think that some of these will become heirlooms as my children start their own families and take a few touches of Christmases past to start their own traditions, but even if they don’t, they will still hold memories and joy for me every time I look at them. I didn’t often get the trendy toy of the year growing up. I never owned a Cabbage Patch Doll or a Furby, but when I was three I did get a Care Bear. TenderHeart to be exact. I loved that bear. I slept with it every night, carried it around the house, he was my constant companion. I called him Tendy. Over the years Tendy soaked up a lot of tears, got a lot of washings, and got hugged until he was pretty much smashed flat. Eventually, when I was in college, I had to admit that Tendy was getting a little too worn to be my constant companion. My father, who’d gotten me Tendy to begin with, went on a hunt for a replacement. At the time he was traveling around the world for work. Everywhere he went, he visited toy stores looking for the softest, cuddliest replacement for my beloved Tendy. I was twenty when I received Scruffy, a gray dog with floppy arms and legs and fluffy fur. Scruffy has since been replaced by my husband, but he and Tendy still sit together in a place of honor in my bedroom. Being sentimental is my super power. My most prized possessions are the bits and pieces that used to belong to someone who matters to me. There’s the Brown Betty teapot that belonged to my neighbor Betty. The stitched wall hanging Aunt Bess made. The wooden butter mold Uncle Willis made for Mom. Dad’s shaving mug. Mom knows this about me (maybe instilled it in me?). Which means she knew exactly what she was doing the year she gave me my favorite book EVER. It’s the copy of Heidi that her own aunt gave her as a girl. Mom must have read it to me a hundred times. There, inside the front cover, it says “To Nancy Cox, Christmas 1954.” And then she passed it on to me one Christmas. And some Christmas down the road I plan to pass it along to my niece–mom’s granddaughter. And hopefully, there will be a great-granddaughter to appreciate it one day–say in 2054? While the Luckenbooth in The Christmas Heirloom was a valuable piece of jewelry, what made it such a prized possession wasn’t it’s dollar value, but rather it’s link to family. My character, Fleeta, lost her mother when she was very young. Having that connection to her mother restored in a way was what gave the pin value in Fleeta’s eyes. It’s much the same with my copy of Heidi. It’s not a book–it’s something my great aunt picked out and wrapped for my mother. It’s the memory of curling into my mother’s side while she read aloud. It’s a connection to people I want with me always. I’m so looking forward to sharing those connections on down the line . . .
My great grandmother enjoyed a long and faith-filled life of laughter. She had a wonderful marriage, numerous children, and even more numerous grand children and great grandchildren. When she passed away, my grandmother, her oldest child, inherited her gold wedding band. Since my grandmother had two sons and no daughters, she chose to entrust her mother’s ring to her oldest granddaughter — me. She gave it to me when I was still a teenager, long before I was in the market for marriage. But, even then, I recognized the pricelessness of that ring. I, like the characters in The Christmas Heirloom, had received a piece of jewelry that had been treasured and worn by my ancestors. What a gift! Years later, when marriage came my way, I had my great grandparents’ initials and wedding date inscribed inside the ring. To this day, I wear it as my wedding band. I hope to pass it down to my own daughter one day. Thanks you so much ladies for sharing your precious gifts and memories with us. To celebrate, I’m giving a gift of a Kindle ebook of The Christmas Heirloom. For the chance to win, enter via rafflecopter below. Please refer to my Policies. The giveaway will close at midnight of 12/10/18. I just love this quote from The Cowboy’s Christmas Reunion, don’t you? But, it’s not the first line. Thanks to Valerie (via Paula) for the image! 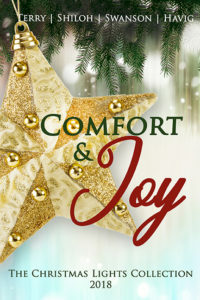 This is also available as part of a boxed set in A Christmas to Remember: Eight Christian Romances Celebrating the Gift of Christmas. So, grab the book nearest you and comment what your first line is (with title and author, of course!) and then head over to Hoarding Books to see all of the other books/blogs featured today. Cowboy Santa: helping his ex-fiancée have a merry little Christmas…When Kade Delgado joins his buddies in a Cowboy Santa program to shower Christmas blessings on old folks and single moms, he doesn’t expect his former fiancée to return to Saddle Springs, in need and with a child in tow. Does God really expect him to treat Cheri the same as the others on his new Christmas list?Cheri Mackenzie has never forgiven herself for the pain she caused Kade by fleeing a week before their wedding, but undoing the past is impossible. Circumstances force her back to her aging grandparents’ Montana ranch, where Kade, now a widower with a toddler, is making himself cheerfully indispensable. When she receives kindness instead of the hostility she surely deserves, she can’t help but pray for a Christmas reunion with the cowboy she’s never stopped loving.Is there any hope for a second chance at love? Valerie Comer is a USA Today bestselling author and a two-time Word Award winner who writes where food meets faith and fiction. 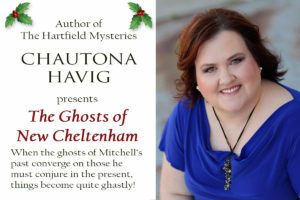 She has been called “a stellar storyteller” as she injects experience laced with humor into her green clean romances. Valerie’s life on a small farm in western Canada provides the seed for her stories of contemporary Christian romance. Like many of her characters, Valerie grows much of her own food and is active in the local foods movement as well as her church. She only hopes her imaginary friends enjoy their happily-ever-afters as much as she does hers, shared with her husband, adult kids, and adorable granddaughters. 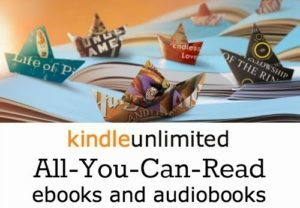 Connect with Valerie in her Facebook Reader’s Group! I confess I didn’t understand enough of the references to other books in this novel; clearly I need to brush up on my classics. But, that didn’t stop me from enjoying it! A Tale of Two Hearts to me is really a tale not just about two people falling in love, but two people learning that it’s important to be themselves and to be honest. Both Will and Mina struggle with their own insecurities and while they set out with the best of intentions, their methods may not be the best choice, but this is one of those stories where if I was in their shoes, I’m not sure I would’ve made a different decision. I appreciate how Michelle kept the story within social norms of the time period. For two people to act married and not be put them in situations that would’ve been scandalous, and this is reflected in both characters actions; their behavior wasn’t changed for modern audiences (i.e. it’s ok to be alone together for awhile, etc.). If you’re looking for a drama where Christmas is an aspect, but doesn’t overwhelm the story and where characters learn to give others another chance, this story is for you. I received a copy of this book from the author. All opinions are my own. Zach has finally come home! Or so Emma believes. I enjoyed this sweet Christmas read, emphasis on CHRISTMAS. It’s filled with all Christmas all the time with Emma slowly but surely converting the Christmas crumudgeon, and two little cuties help! One thing I like about this story of a sister-brother -in-law falling in love story is that Zach respected Emma’s and Steve’s relationship- he never tried to convince Emma otherwise at some time in the past and Emma truly loved Steve; her feelings for Zach didn’t morph until in this story. That is something that this troupe in general often annoys me – the whole “I had feelings for you, but I married your brother anyways for whatever reason.” Tina did no that which made me like the characters and connect more. I also respected Zach and admired him even, for choosing to remove himself from the situation. While I don’t agree with avoiding his family, I get it. The secondary characters are also great. This is the first book in the series I’ve read and I didn’t feel like I missed anything, but I’m definitely going to catch up! I set out in late November to try to read as many of the Love Inspired Christmas stories for 2017 as possible. I didn’t succeed in reading them all, and in fact still have a stack that I checked out from the library still not read, but it was a valiant effort. Here’s a list of which ones I did read and putting them into three categories. My favorite of this set of Love Inspired is a series: Texas Ranger Holidays. I has three books, that while not quite standalone, wrap up enough of the threads in each. I actually started with book two, but didn’t feel like I missed out, and like it so much I went and got the first one, which is technically a Thanksgiving story. These few I just couldn’t get into for whatever reason. As I was reading fast trying to get through them all, if it didn’t really pull me in in the first couple chapters or I didn’t like the characters, I put it down. If it was another time of year, I probably would’ve stuck it out. Some I did finish, but still didn’t intrigue me like the others listed above. Welcome to another installment of First Line Fridays, hosted by Hoarding Books. This is book #3 in Melissa Tagg’s novella Christmas series. While you can read this one independently, I encourage you to pick up the first two as well. Now all three are also available in one set.